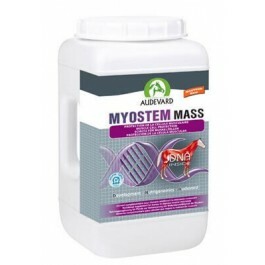 Myostem Mass is a complementary feed formulated by AUDEVARD Laboratories. Rich in essential and limiting amino acids, it is designed to provide nutritional support for muscle development in horses undergoing training and horses that are older, out of shape, recovering from a disease, as well as growing foals. Appropriate nutrition is required to promote muscle development. Muscle cells are made up of speci­fic proteins, themselves consisting of speci­fic combinations of amino acids. A lack of limiting amino acids in horse feed can often hinder muscle growth. The Myostem Mass formula provides a calculated and concentrated amount of limiting amino acids, so called as they are often found in insufficient quantities in food. This formula provides 60g of amino acids per day. It contains fenugreek, which imporves feed intake and propbiotics to help with digestion. 2.1kg - sufficient for up to 21 days use in adult horses (42 days use in foals). Raw materials: potato protein, Fenugreek (Trigonella foenum-graecum), Calcium Carbonate, 12.1.5 Extract walls of specific yeasts, molasses. Additives: Aromatic 2b Substances: L-Histidine 19.6 g, 19 g Leucine, L-Phenylalanine 11.4 g. 3c-amino acids: L-Arginine 3c3.6.1 21 g, 3.2.3 L-lysine monohydrochloride 16 g, 3.3.1 L-threonine 10.6 g, 3c3.7.1 L-valine 6.7 g, 3c3. 8.1 L-isoleucine 2.5 g, 2.5 g methionine 3c301. Analytical constituent: Humidity <8%, crude proteins 62%, crude fats 2.5%, crude ashes 12%, crude fibres 1%, sodium 0.5%. Adult horses: 4 measures per day for 3 weeks minimum. Foals: 2 measures per day for 3 weeks minimum. To get the best results with Myostem Mass, it is important to provide a feed rich in carbohydrates (cereals etc) and to give the product in the hours following exercise, so that it is assimilated during protein synthesis. If your horse does not work or only works a little, use BO YEA SACC instead. For intensive support, Myostem Mass and Bo Yea Sacc can be administered together.